Mildred P. “Midge” Lemmons, 103, of Princeton and formerly of Henderson and Kattawa, Kentucky, passed away Sunday, September 2, 2018 at River Oaks Health Campus in Princeton. She was born August 16, 1915 in Princeton, IN to Cordie W. and Matie M. (Stewart) Rothrock. 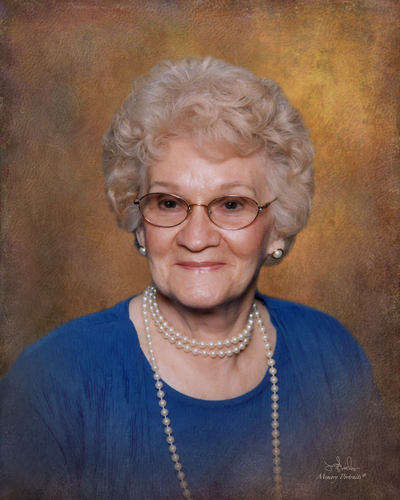 She was a member of First Baptist Church in Kattawa, KY. She was formerly an aide at the Henderson Methodist Hospital and also along with her husband, owned and operated Henderson Downtown Motel. She was a member of the Rebekah Lodge and she was a Kentucky Colonel. She is survived by her children, Betty Kuester (Don) of Henderson, Ky, Phillip M. Lemmons of Florida, Mike Lemmons of Murray, Ky and Jack Lemmons (Barbara) of Bradenton, Fl; daughter-in-law, Kay Lemmons of Haubstadt; 11 grandchildren, 15 great grandchildren and 15 great-great grandchildren; and several nieces and nephews. She is preceded in death by her parents, husband, William “Bill” Lemmons in 2010; son, William “Bill” Lemmons; brothers, Claude Rothrock and Ralph Stewart; and sisters, Ruth Willis and Elsie Phillips. Funeral services will be at 1 pm on Thursday, September 6, 2018 at Colvin Funeral Home in Princeton, IN, officiated by Chaplain Levon Dozier. Burial will follow in the Columbia White Church Cemetery in Princeton. Visitation will be from 11 am until service time on Thursday at the Colvin Funeral Home. Memorial contributions may be made to the Southern Care Hospice, 12251 US-41, Suite C, Evansville, IN 47725. Envelopes will be available at the funeral home. You may leave a message of sympathy or light a memorial candle in memory of Mildred at www.colvinfuneralhome.com.